Rare earth oxides and their respective metals are surprisingly common. Photo ARS-USDA by Peggy Grubb. Most of us are familiar with elements – the building blocks of matter. Most of us know about elements such as oxygen, nitrogen, carbon, sulfur, sodium, and helium. Yet, there are other elements few have even heard of, despite their immense technological and medical importance. Let’s talk about rare earth metals – what are they good for, and where do they come from? Rare earth metals are used in heat-resistant, powerful, permanent magnets. Rare earth metals are used in superconductors for cryogenics applications. Rare earth metals are used in pyrophoric alloys for initiating combustion. Rare earth metals are used in compact fluorescent lighting, light-emitting diodes and fiber optics. To be better informed in discussing these elements, it is appropriate to consult the Periodic Table of the Elements. The periodic table of the elements includes the rare earth metals. Image by Los Alamos National Labs. The number of protons in their nuclei. Elements are laid out horizontally and vertically in the chart so that all three of the above features are properly represented. The properties of elements within a particular group bear an almost familial relationship with each other. They accordingly bear descriptors such as alkali metals, alkaline earth metals, halogens, and inert gases. Larger groups are more generally described as transition metals, metalloids, and non-metals. However, electron orbital filling behavior alters significantly on reaching the 3rd electron shell. This requires the chart to deviate from the norm, beginning with scandium, atomic number 21. Particularly is this so for elements 57 to 70 (the Lanthanides) and elements 89 to 102 (the Actinides). The rare earth elements (REE) or rare earth metals (REM), of which there are 15 in number, occur together in nature with two non-lanthanide elements, scandium and yttrium. All 17 elements behave similarly chemically. Although scandium and yttrium are considered transition metals, they are in at least some sense part of the same group as the lanthanides. The term earths applies to rare earth metal oxides. The 17 rare earth metals, by name and atomic weight, are scandium (21), yttrium (39), lanthanum (57), cerium (58), praseodymium (59), neodymium (60), promethium (61), samarium (62), europium (63), gadolinium (64), terbium (65), dysprosium (66), holmium (67), erbium (68), thulium (69), ytterbium (70), and lutetium (71). 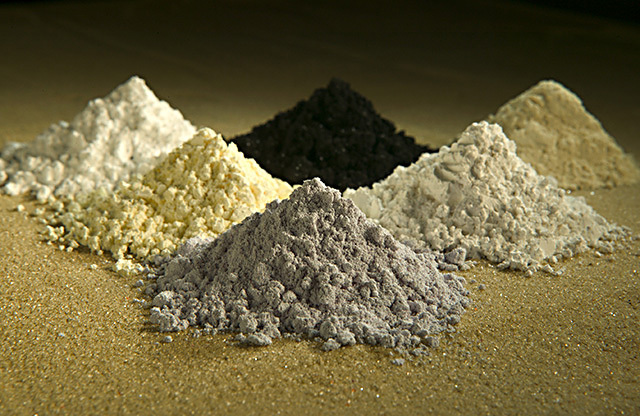 Monazite deposits of the rare earth metals are phosphate minerals most commonly found in India, Madagascar, and Africa. A preferred modern source is bastnäsite, which is a carbonate-fluoride mineral found in Burundi. By far the most plentiful of the rare earth metals in these “ores” is cerium. Oh, yes, there are other rare earth metal ores. Geology.com informs us there are other sources of rare earth metals, including apatite, cheralite, eudialyte, loparite, phosphorites, rare-earth-bearing (ion adsorption) clays, secondary monazite, spent uranium solutions, and xenotime. Curiously, rare earth metals are not particularly rare. In fact, most of them are more common in earth’s crust than silver is. Many are more abundant than lead. Some are even more common than copper! This is most surprising. The rare earth metals almost seem shrouded in secrecy. Some have wondered, “Is this somehow due to their technological importance?” In fact, China, a major-league technology production player, is limiting rare earth exports. In view of the recent advances in technology through materials science, it behooves us to make a closer inspection of the rare earth metals. Certainly they are of interest to at least some major nations, with good cause. where is californium on the list of metals? Californium is not one of the rare earth metals. See the periodic table by Google Search. I have seen some of the super magnets using neodymium. They certainly are strong and should NOT be used by children. You can get quite a painful pinch if they snap together! An appropriate precautionary statement. Thanks, Meg.